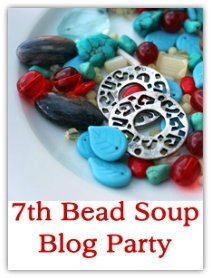 Its finally time to reveal my pieces for the Bead Soup Blog Party. A little reminder of the soup I received from my partner Carmen at Little Maketto... loads of interesting little packages...And lots of challenges!! Remember we have to use the focal and the clasp that is sent to us but we can use some of our own beads in our creations too. I used Every.Single.Bead that Carmen sent me, bar 1, and I added a few of my own to two of the pieces. The first piece I made was a cuff bracelet with memory wire. I absolutely love how it turned out. I wasn't sure what to make with the lilac teardrop shell beads that were in the soup, until I received an order from Ply containing these gorgeous turquoise Moroccan Flower beads. I also added a handmade wire bead to make a pendant. This is totally my favourite piece of all. The purple miracle beads were perfect for a bracelet, I teamed them up with my own stash of lime green frosted glass beads and made a cluster bracelet. I used the wee butterfly beads too and the beautiful clasp. 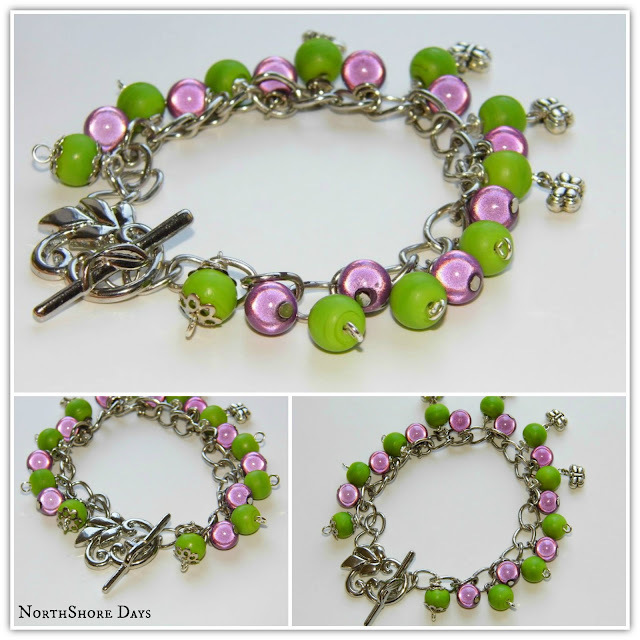 This bracelet just shouts Spring doesnt it? I also had 3 gorgeous Agate disc beads as well as a few leaves, in my soup. The colour palate is perfect for Autumn and that's the season I'm currently experiencing! I added in 2 large bronze rings to complement the discs. 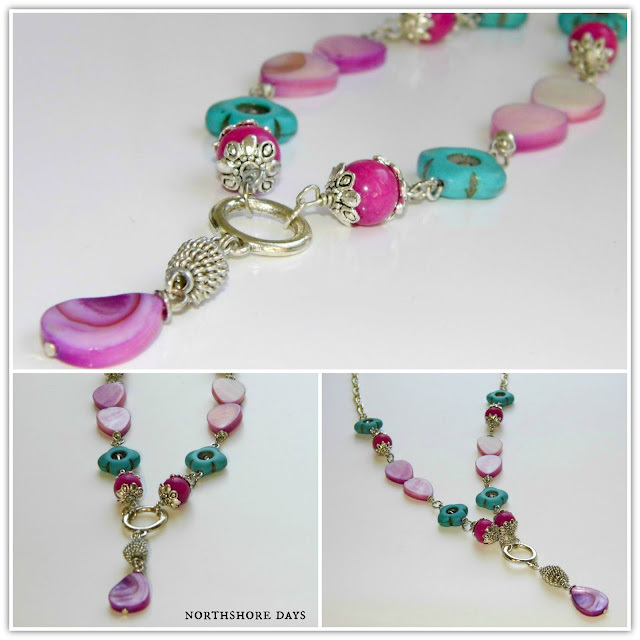 To follow all the other blogs taking part in the huge Bead Soup Party, click on the picture below and it will take you to Lori Anderson's blog, Pretty Things and the blog list. Beautiful designs! 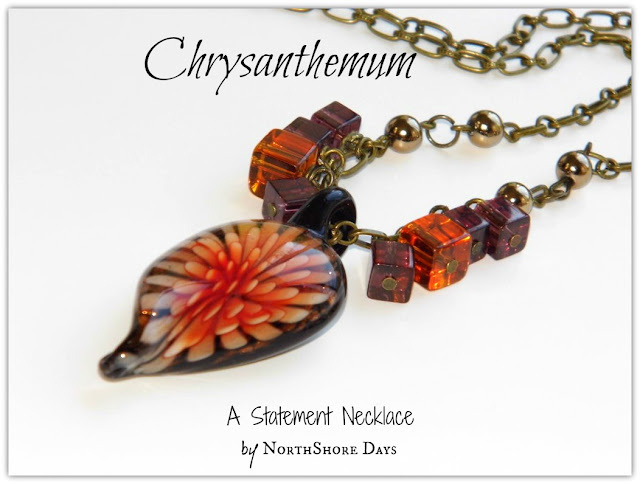 I love your Chrysanthemum necklace... such a beautiful focal! 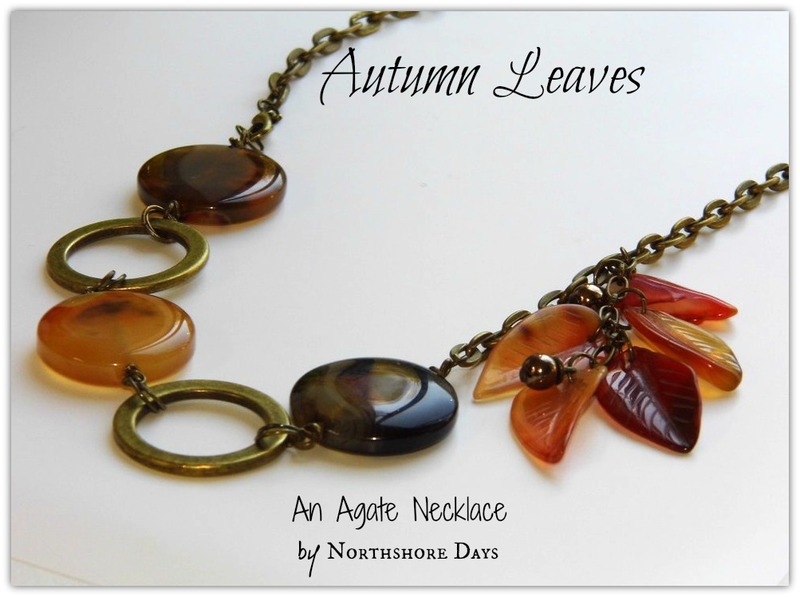 I love everything you made but being an autumn girl I adore those 'Chrysanthemum' and 'Autumn leaves' necklaces! Autumn leaves is my hands-down fave. But what fabulous pieces. You've got a great eye for colour. Way to go Natalie! You've done a beautiful job with all of those pieces! I'm so impressed! Beautiful. I think the Lilac Bouquet is my favourite. You really did a beautiful job with all of your beads!!! I love seeing your creative mind at work! Wow - you made that soup sing! All of your pieces turned out stunning. Especially love the Liquid Sunrise bracelet. Beautiful photography as well. Fabulous pieces and I can't pick a favourite! Lilac Bouquet, Autumn Leaves or maybe....... yes,the cuff bracelet is the winner!!. Wow, what gorgeous pieces you created Natalie!!! So beautiful!!! My favorite is Spring Morning - so so pretty! You have so much talent and your photography is awesome!!! NAT!!!! I'm so late in visiting your blog...! I love all the pieces you created... the cuff bracelet is indeed a surprise! u also did such a great job on the photography... i feel like i'm in love with all your pieces...!!! 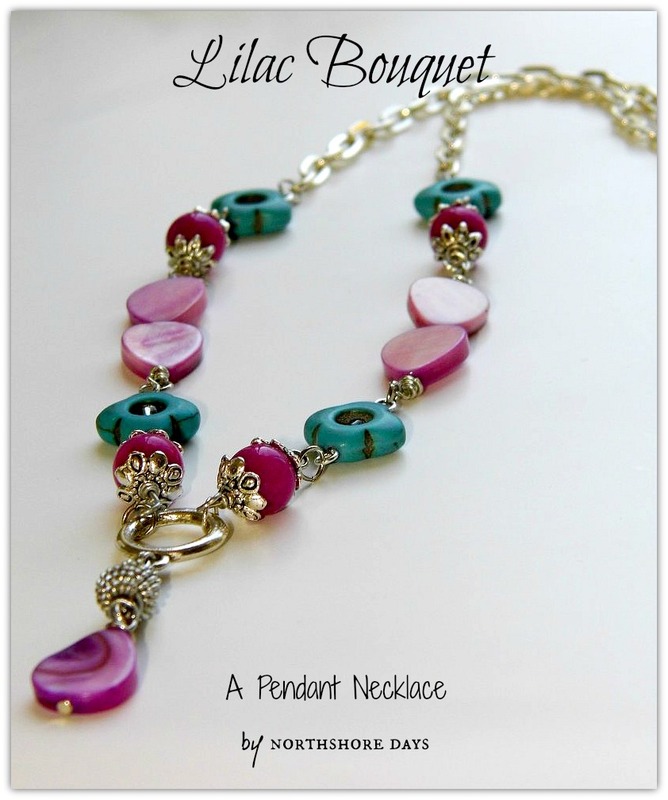 you did wonderful justice to the agate beads and i must say the lilac bouquet is a surprise. didn't think such simple beads could be made into such a pretty necklace. i hope you had as much fun with the soup as I did with the one you sent me!! Yay to a successful BSBP #7! 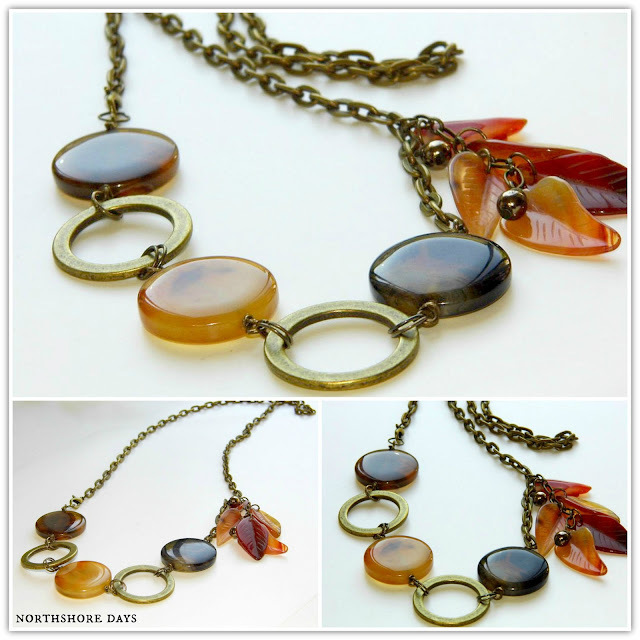 OMGoodness, these pieces are amazing...I LOVE Liquid Sunrise & Autumn Leaves. What am I talking about, I LOVE them ALL!!! Great soup girl, delicious! Loving Chrysanthemum and Autumn Leaves! Both are stunning! The cuff bracelet is amazing! I love all your pieces! Great work! Oh, ALL of those are so gorgeous! I love your colour combination of the fuschia, turquoise and silver...just beautiful! 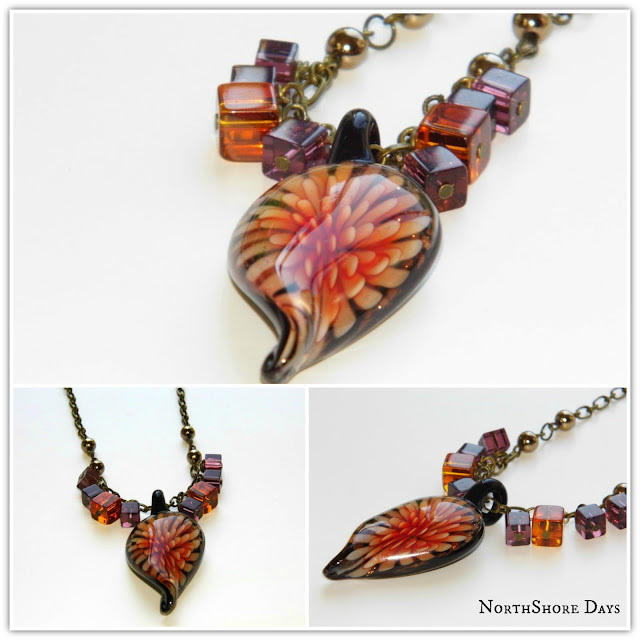 And that autumn necklace is just...wow! And the spring bracelet is so joyful! Beautiful, just beautiful. Gorgeous jewelry! I love the use of square beads with the flower focal. I don't know which piece I like better. Liquid Sunrise is so elegant, but the colors in Lilac Bouquet just sing! I can't make up my mind. And your photography ... so professional... shows your pieces off to great advantage. I loe the statement and agate necklace. Each piece is stunning, they almost hurt the eyes they are that gorgeous. Beautiful creations! 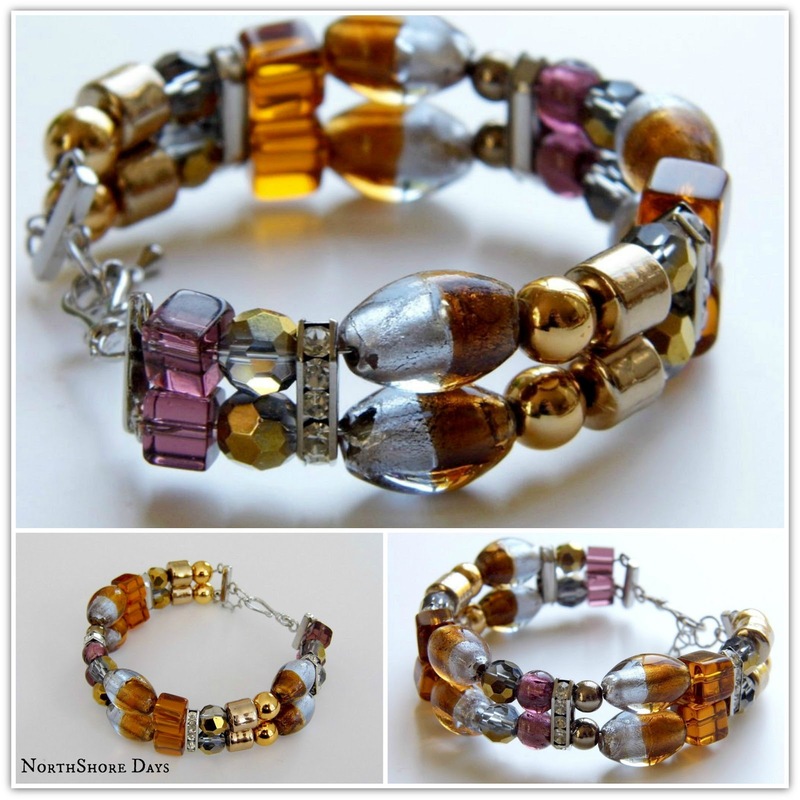 I love all the warm, earthy tones and feel of the cuff bracelet, the chrysanthenum necklace and the agate necklace. Elegant and classic....just my cup of tea! What great designs! I especially like that first bracelet and the last necklace. great pieces, especially bracelets / especially the first one:)))/, congrats! Your jewelry designs are simply stunning! Love love love them all!!! I have been eyeing up your pieces in pinterest. Just beautiful. And you know how I feel about Autumn leaves! Sigh! Love, love, LOVE!! Especially that first cuff bracelet!! Great work!! Really beautiful! I love that pendant with the flower on the inside! Beautiful designs! I just love them. What gorgeous pieces you've made! Stunning! Oh, my! These are so gorgeous! Wow, stunnig jewelery you made. I love them all. I can see the sunrice in the bracelet. very nice. And beside this: wunderful photos. Great work! I love all the pieces --the colors and designs are beautiful. That spring bracelet really makes me smile! All the designs are beautiful. I love the Chrisantemum and the Autumn Leaves necklaces. Wow! So many beautiful, colors pieces - awesome job! 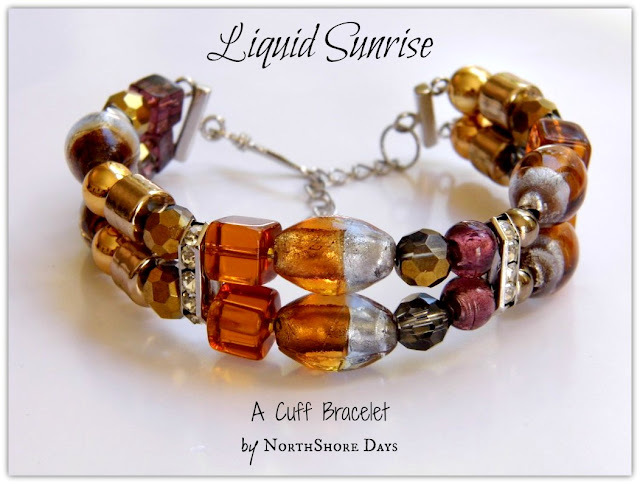 Fav is the liquid sunrise cuff bracelet. Nice photos as well. 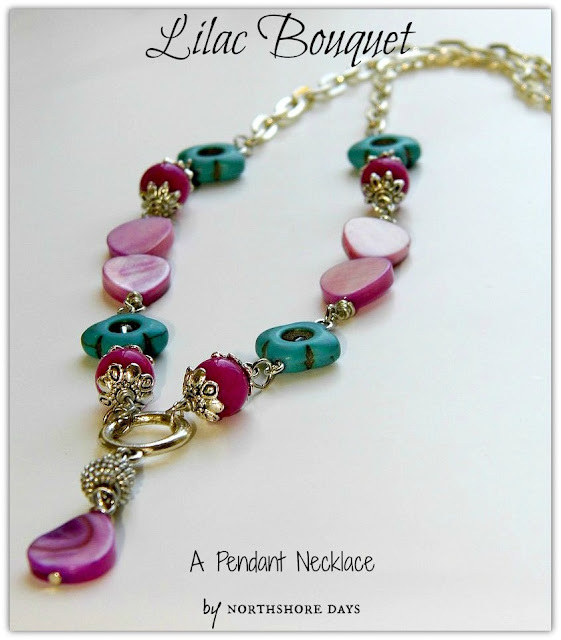 Lovely pieces, liquid sunrise is fabulous, your colour combinations are beautiful. Really pretty pieces, love the colour combinations, the last necklace is my favourite. Great soup and great designs. I love your jewelry and your photographs. Really beautiful! Fabulous designs!! So eye catching. Really Soup-er! Natalie I can't pick a favorite because all of your designs are so good. You have a wonderful sense of what to use to make the beads really pop. Your pieces are all fantastic! Beautiful designs and color...well done! Oh my gosh, you made so much, and they are all beautiful. If I had to pick a favorite, it would be Lilac Bouquet. All five of your designs are great. You used your soup well. I can't pick a favorite. They all have their own flavor. You made an amazing collection with your soup!! Your pieces are all so great. I really like your bracelet with the memory wire. I've been wanting to make a cuff with memory wire for a while, and you may have finally inspired me to just do it! I love the gold/bronze you paired with the purple. It's regal and elegant and just luscious. As well, your necklace with the focal is beautiful. I especially like the way you dangled the cube beads. The effect of them sitting side by side is kinda cool. Excellent work! !